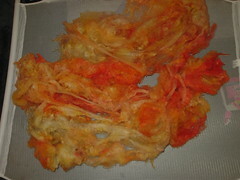 Here's a shot of the Rambouillet fiber I dyed Yellow. If you want to see the rest of 'em, clicky on the photo and it should (hopefully) take you to the flickr album where they are. If not...go to my dye page; they're all together on the bottom of the page!